I’ll admit it, I’m a little bonkers for bivalves. I love scallops grilled or sliced thinly and drizzled with olive oil as carpaccio, I love meaty mussels steamed in wine and cream with thyme, I love clams baked with garlic and butter or boiled with ale and chorizo. But the best of them all, in my humble opinion, is the oyster on the half shell. Much has been written about the oyster, and much debated. It’s purported to be an aphrodisiac. I often feel amorous after eating a dozen, but most often I’m also drinking champagne. Purists will complain if you put anything at all on a raw oyster. I’m a squeeze-of-lemon-and-bit-of-horseradish guy. I would never think of putting cocktail sauce or Tabasco on such a delicate thing. That’s for people who are trying to hide the fact that they’re eating a raw oyster. Of course, necessity being the mother of invention, I had oysters but no lemon and no horseradish so had to be creative. I did have a knob of fresh wasabi ($100 a pound at the Japanese market! ), and some grapefruit my father-in-law had pilfered along the median in Palm Desert. Combined with a bit of ponzu from the fridge, and I’d discovered a palatable new take on the oyster. Plate oysters on their half shells. Place a small dab of wasabi on each oyster. 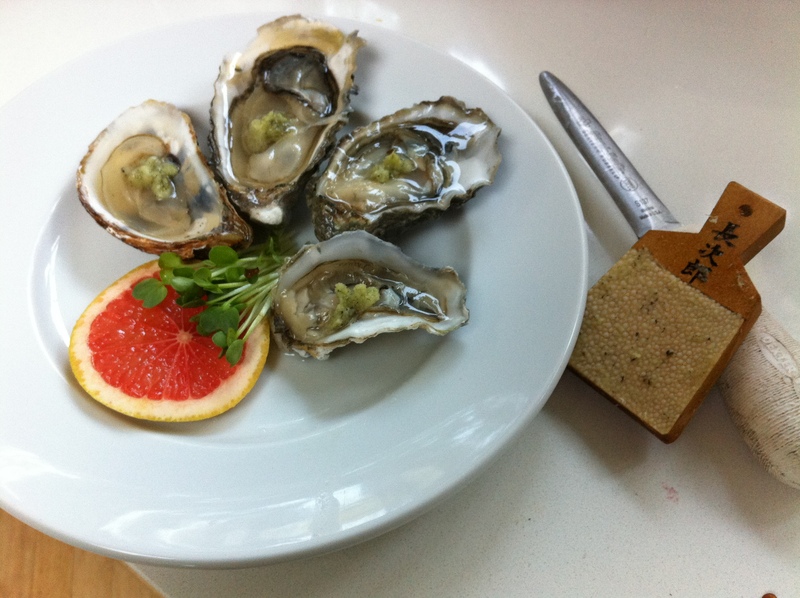 Squeeze a little grapefruit over each oyster, then drizzle with ponzu. Serve. Place oysters on a large baking sheet. Place a small dab of butter on top of each oyster. Smear butter dab with a little of the grated garlic. Then sprinkle each oyster liberally with parmesan. Broil in the oven for approximately 10 minutes, or until cheese becomes golden and begins to brown. Remove from oven, squeeze with a little lemon and serve. *This is a favorite we enjoy up near my mom’s in Sonoma County during the summer, cooked with plump oysters fresh from Tomales Bay. Heat a grill to high. Place oysters on a large platter. Place a dab of butter on each, then a teaspoon or so of barbecue sauce. Grind a bit of fresh pepper on top, and place on the barbecue. Cook for 5-7 minutes, or until sauce is glazey and oysters look plump and cooked. Serve. I agree, I love the clean simplicity of lemon and horseradish, or a nice Mignonette Sauce. I would have oysters every week if it wasn’t such a pain (and scary) to shuck them. Good to see you feature the oysters. Incidentally, I just returned to Chicago last night from Key West where . . . you guessed it! . . . I toured Hemingway’s home and ate a whole bunch of oysters every night with cocktails. First time I’ve actually had grilled oysters, I’ve always just eaten them raw before. How are you pizza oven plans coming along? I love mussels but the sauce is the best part…do you have a good recipe? Dunking the bread is my favorite. I do have a GREAT recipe for mussels. All things in good time. Where do you buy your oysters, Sean? I’ve always wanted to go downtown to the fish markets to get oysters, but I’ve never been able to go down early enough. I typically get them at Santa Monica Seafood, or at the Santa Monica Weds. farmer’s market where there’s an aquaculture farm selling them. Never been to the seafood markets downtown, but yeah, that would be a kick. That reminds me, I should do a post on the Tsukiji Fish Market in Tokyo — that was one of the most amazing experiences ever.